We're seeing a lot of the Moto 360 as we approach IFA 2015, with the latest image to hit the net showing the new model and the old version side by side. The clear-as-day leak gives us a chance to see how the next generation Moto 360 differs from its predecessor, and one notable thing is the size. The new Moto 360 looks slightly smaller than the original, sporting the same black flat tire design. However rumours suggest were in for two versions of the new Moto 360, with one being larger with a beefier battery, which means we might be looking at the smaller one in this image. The photo was shared on the Hellomotohk Facebook page, where it calls the new Moto 360 the Moto 360s. We've also heard two versions rumoured before, so we're inclined to believe it's true. 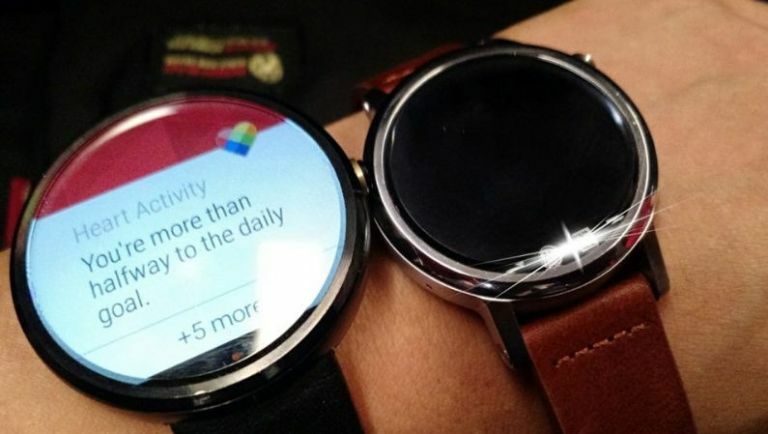 The leak also matches what we've already seen from the new Moto 360. That includes new strap lugs as well as the repositioning of the right-side button that's now been moved to the 2 o'clock point. We're expecting Motorola to unveil the Moto 360 2 (or whatever it's called) at IFA 2015 which kicks off next week. It'll do battle with the Huawei Watch and the Samsung Gear S2 which are also due to launch.